RCA Records introduces the 45 RPM Extended Play record. An extended play (EP) is a vinyl record which contains more music than a single, generally twice as much music, but is too short to qualify as an LP. EPs were introduced as compilations or samplers and typically played at 45 RPM. Some later releases were playable at 33 1/3 RPMs. The 33s were more common as special releases for jukeboxes and for common retail releases in various countries throughout the world. 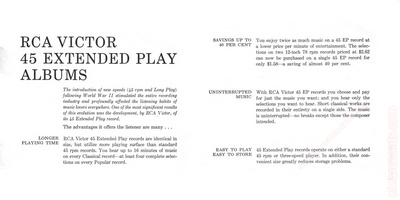 Here is a very early advertisement introducing the extended play record. RCA Records introduces the 45 RPM Extended Play record. 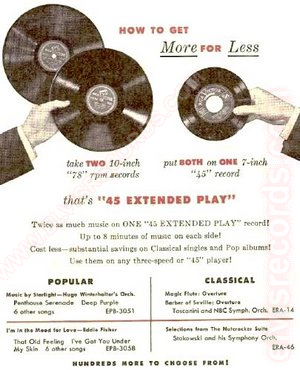 "Twice as much music on ONE "45 EXTENDED PLAY" record!" Neat ad that I came across some years ago. 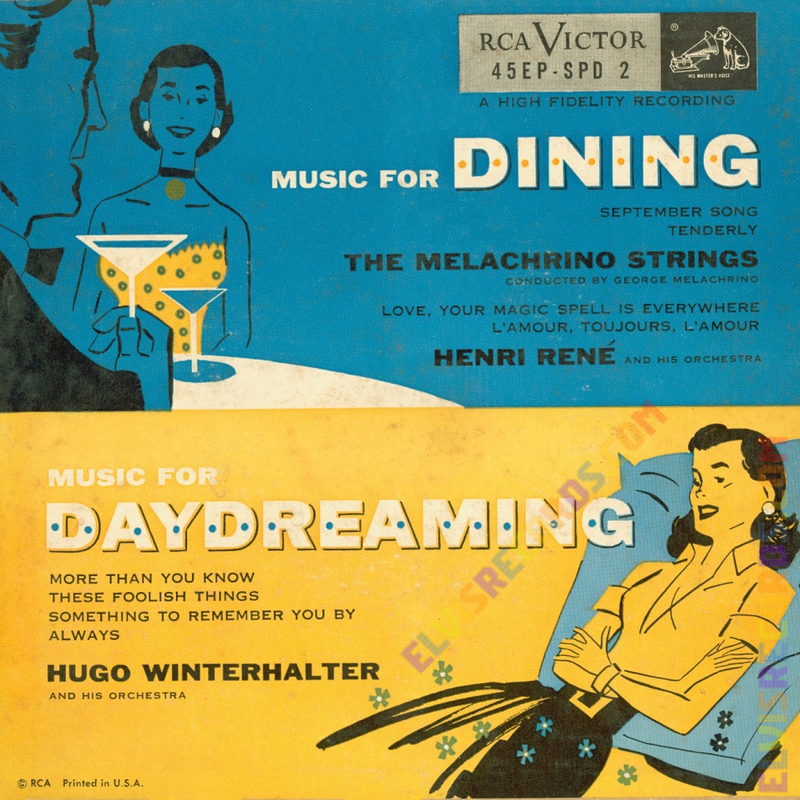 The RCA Victor 45 Extended Play Albums advantages are detailed in this gatefold of RCA Victor 45EP SPD 2 Music for Dining by the Melachrino Strings and Music for Daydreaming by Hugo Winterhalter and his orchestra. 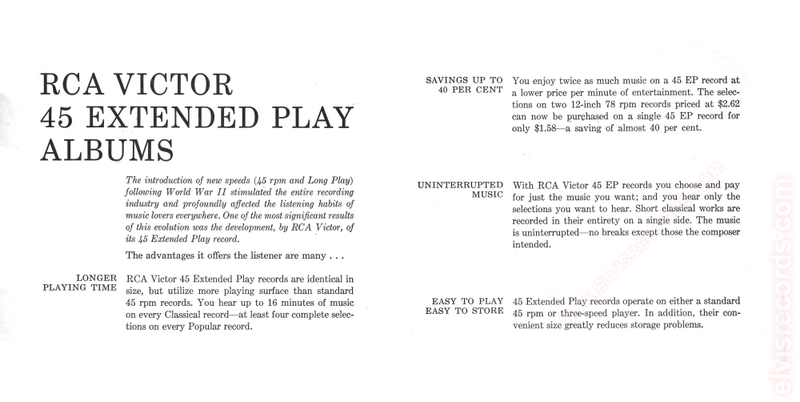 RCA Victor offers four advantages in this offering of the Extended Play Albums. Longer Playing Time - up to 16 minutes of music, at least four complete selections on every Popular record. Savings up to 40 per cent - The selections of two 12-inch 78 rpm records priced at $2.62 can now be purchased on a single 45 EP record for only $1.58. Uninterrupted Muisc - the music is uninterrupted - no breaks except those the composer intended. Easy to Play, Easy to Store - 45 Extended Play records operate on either a standard 45 rpm or three-speed player. Their convenient size greatly reduces storage problems.